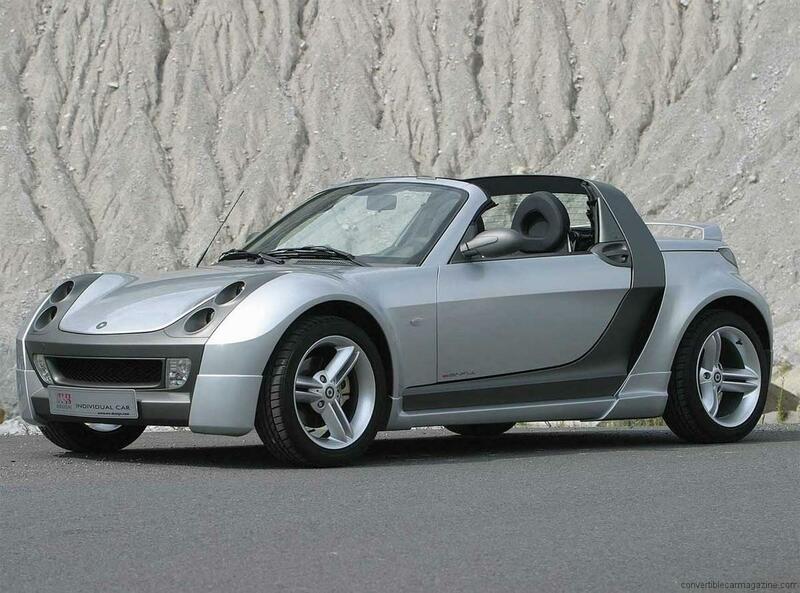 The Smart Roadster isn’t your average Smart mini. Its suspension is much more sophisticated being geared more towards enthusiast driving than urban comfort. The engine puts out a whopping 80bhp which sounds pathetic until you come to realize that the car weighs a mere 709kg. The power supplied by the engine is enough to boast a 0-60 time of 10.7 seconds and a top speed of approximately 110mph. If you should opt for the 101bhp engine the top speed reaches 122mph. The engine sits to the rear of the driver optimizing cabin space. The Smart Roadster is very inexpensive. It gets decent fuel economy and boasts low insurance rates, asking price, and maintenance costs. Although servicing charges are low, you won’t be spending much time in the garage as the mechanics of the Smart cars is always of high quality and respectable reliability. The cabin is very spacious, offering more useful space than that of competitors of larger class sizes. Head and legroom are plentiful though elbowroom can become a problem when trying to seat two larger occupants at one time. The passenger seat folds flat and has a cup holder on the back. The instrumentation is all functional as well as practical. The gauges are clearly labeled and in the driver’s line of sight. This reduces driving fatigue as searching for the speedometer and tachometer is unnecessary. The fascia is uncluttered and all the switchgear is easy to operate. The Smart Roadster provides both occupants with plenty of head and legroom to be comfortable. The seats are supportive but aren’t overly firm. Engine noise can be intrusive at times of hard acceleration, but with only three cylinders that is expected. Due to the fact the body roll has been greatly reduced and traction control gives the driver a sense of confidence when cornering, the Smart Roadster is able to speed through corners with ease. Getting into the Roadster can be a bit of a challenge for taller passengers. The seats are wide however, making it un-necessary to reach for the seat as you stoop into it. The foot well is wide and the large door apertures allow for unrestricted access. The boot is easy to load and unload, though heavy items may make this task slightly more difficult as it does sit low. This aside, the lid does open wide enough to allow for easier access. Parking the Roadster is easy even for the most inexperienced, due to its small dimensions, a tight turning circle, light and precise steering, good visibility, and light acceleration. Though with the hood up, Rear visibility is reduced but it shouldn’t be a problem. The Smart Roadster is geared towards enthusiast driving. Suspension is tight and responsive, steering is speed sensitive, and the brakes will give the driver added confidence as they will bring the car to a stop quickly. The gauges are easy to read and the instrumentation is all reliable. This would be a terrible choice for a family vehicle that is unless it is a family of two. Should you want to try to make this car work as a second vehicle you must take into consideration that the boot is rather small for the oddments associated with family life. This would make a great first car it is inexpensive both to buy and maintain. It is reliable, not absurdly fast, boasts upgraded suspension and traction control, and its small size makes it easy to drive through busy city streets. The materials used in the cabin of the Smart Roadster are fine in quality, it is a shame the craftsmanship holding the materials together isn’t of the same quality. If taken care of the car’s interior will not pose any problems however. The security features on the Smart Roadster are; a roll bar, crumple zones, Drive Lock (automatic activation of the central locking when driving), remote central locking and immobilizer. As far as safety is concerned the Smart Roadster boasts a roll bar, crumple zones, a crash sensor which will turn on hazard lights automatically, front airbags, seatbelt pretensioners, ABS, and skid control. The in-car entertainment consists of a CD/radio unit and two speakers that play clean and crisp, though they can be drowned out by the engine noise when traveling at motorway speeds. The interior comes in two colors choices, scribble red and scribble black. The exterior comes standard in black, shine yellow or spice red. As a cost option, the colors champagne remix, star blue or glance grey can be selected. The cost effectiveness of the Smart Roadster makes it very appealing to young drivers. It is sporty and small, but lacks the high insurance premiums of most sports cars. It is a great money-for-value car and will continue to be reliable after several years.